Monitoring equipment set up to study Antarctica’s McMurdo ice shelf. These quakes, documented in a recent study in the Annals of Glaciology, were discovered somewhat by happenstance by a team of researchers working on Antarctica’s McMurdo Ice Shelf in late 2016 and early 2017. As lead study author Douglas MacAyeal of the University of Chicago explained to Earther, the group had traveled to the area to study how meltwater on the surface of ice shelves—the floating fringes of glaciers that have spilled into the sea—can cause the ice to flex and crack, hastening its demise. The ice, as MacAyeal put it, was “alive with this buzz, or static surge” that cranked up during the coldest part of each day. To learn more about the weird static feedback, the researchers placed seismometers out in two different spots on the shelf: One in a cold, dry area featuring a thick layer of firn, or compacted snow, and one in a wetter area to the west where all that surface insulation had been stripped away. The firn-free area, MacAyeal explained, was frozen at the surface, but the ice just below was slushy because as sunlight filters in, its heat becomes trapped as it would in a greenhouse. “We were a little skeptical that we’d see anything,” MacAyeal said. A researcher working on a slushy section of the McMurdo ice shelf. But instead, the instrument sitting on the slushy side of the ice shelf recorded intense seismic activity, every day from mid-November to early December as the sun dipped low in the sky and temperatures fell. At the drier site, the researchers didn’t see any of this daily quaking. What the researchers think is happening is that the frozen cap atop the slushy ice is contracting as the temperatures drop, before snapping back under the force of gravity. Whenever this happens, it creates a small icequake. This explanation was supported both by the overlap between the seismicity and temperature, and by models the researchers constructed. Although they only looked at two spots on a single ice shelf, the scientists speculate that “thermally regulated seismicity may exist on all ice shelves that undergo surface melting and freezing, especially those that have lost their protective, insulating firn layer.” Such icequakes could, they suggest, offer a practical tool for remotely monitoring how melted ice shelves or glaciers have become, an especially relevant topic in a warming world. “What’s novel about this study is not so much the fact that the icequakes exist... but rather why they exist,” Chaput wrote Earther in an email. He called the paper a “really lovely bit of investigative reporting” for convincingly tying the quakes to daily temperature swings. “This observation, and in particular the interpretation of it related to thermal bending of a frozen lid over a partially melted slushy layer, is rather novel, and fits in well with other very recent works... in the sense that the very near surface of shelves can be viewed as a coal mine canary, but that unlike the canary, it makes quite a bit of noise before going silent,” Chaput continued. 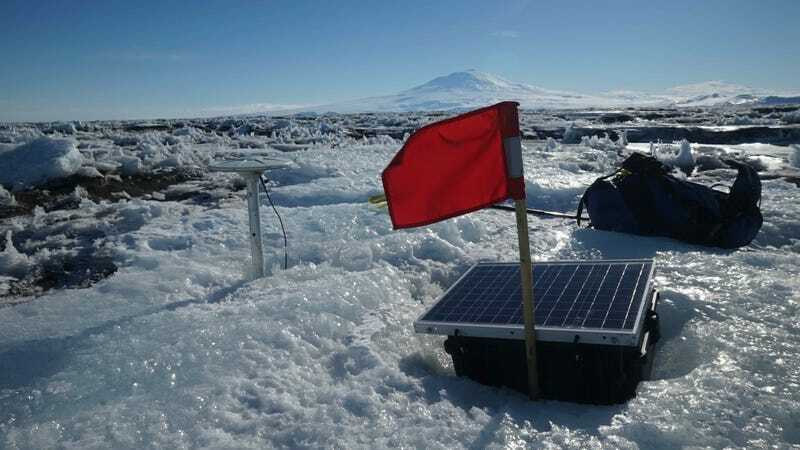 MacAyeal said his group is now hoping to set up similar seismic monitoring on the Antarctic Peninsula, a region that has experienced some dramatic warming and that has seen several spectacular ice shelf breakups in recent years. He’s excited to see seismology find practical applications in something as relevant as the melting and demise of Antarctic ice.